I had read this text before, when it was included as a double-page spread in The Hush Treasure Book anthology, also illustrated by King. I loved it then and I love it even more now. It originally read as a simple, tender love poem for families and relationships, which the reader could relate to on a personal level. Now, combined with illustrations in a book of its own, it offers new meaning in so many ways. It is a profoundly moving love poem, not only for families but also for our planet and all its inhabitants, animal and human—a prayer for our survival. Reading the beautiful language and realising its meaning would be affecting enough, but combined with the superb illustrations, it becomes sublime. The illustrations contain pictorial references not only to caring for individual families, but also to the plight of refugees, endangered animals and the environment. 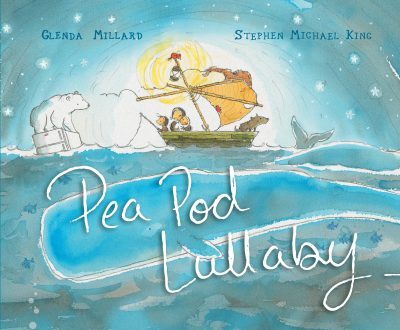 The basic message is one of love and caring for each other; Pea Pod Lullaby says there is hope for us and the world. This is highly recommended for all ages.